The holidays are near and we’ve been in the kitchen baking up tons of comforting cheer. 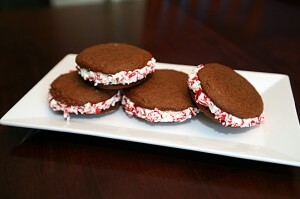 Whoopie pies are still one of the “it” bakery items. Specialty shops are popping up everywhere and we can see why; they’re so easy to make. Skip the line at the bakery and make these pies yourself. You’ll be in and out of the kitchen in less than 30 minutes. Plus, for the price of one at those gourmet bakeries, you can make enough to last a week for you and your family (and now splurge on that BLD for NYE). Preheat oven to 375. In a large bowl add cookie mix, ginger, butter, water and egg. Combine together with a hand mixer until a dough forms. Using a medium sized cookie dough scoop or tablespoon, drop rounded balls onto a baking sheet lined with parchment paper. Bake for 10-12 minutes until the edges of the cookies are set. Remove from baking sheet to a cooling rack and allow to cool completely. In a small bowl, add cream cheese icing with cool whip. Gently fold together until combined. Chill filling until the cookies have completely cooled. Match cooled cookies together in sets of two. Using the flat side of one cookie, spread about 1 to 1 ½ tbsp of filling on. Place the other flat side of the second cookie onto the filling to make a sandwich. Push the cookies together to allow some of the filling to come out of the sides. Continue this step with the remaining cookie sets. Place your crushed candy pieces into a shallow bowl. Push the exposed filling edges of each sandwich into the crushed candies, moving around until all sides have been coated. Plate and enjoy or wrap in parchment paper and tie with a pretty bow as a gift!